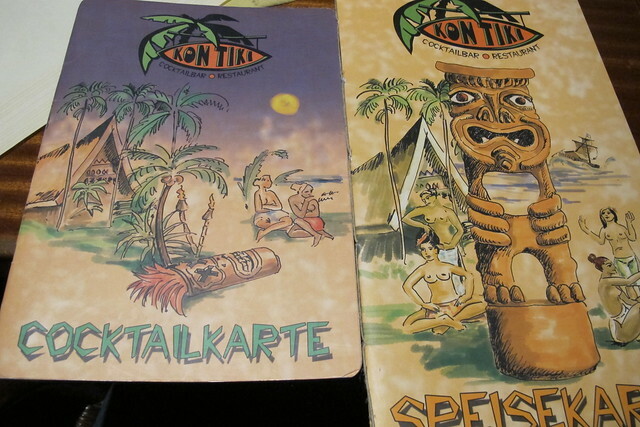 Within the medieval wall encircling the old town of Nuremberg, Germany, there is not just one but two tiki bars: Kon Tiki and Die Blume von Hawaii. They’re quite different from each other, but each is wonderful in its own way. Conveniently, they also happen to be within walking distance of each other. 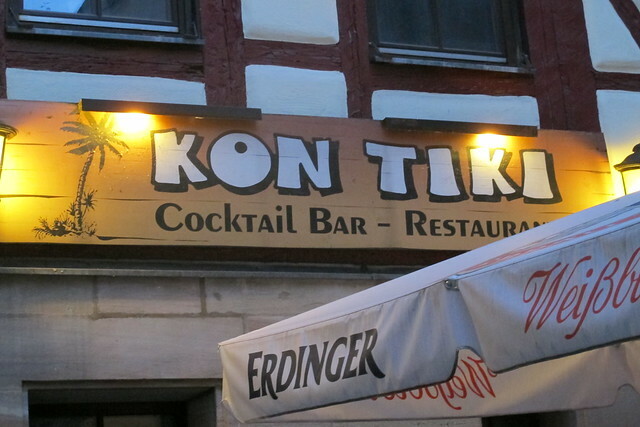 We decided to start our evening at Kon Tiki, since it’s also a restaurant. 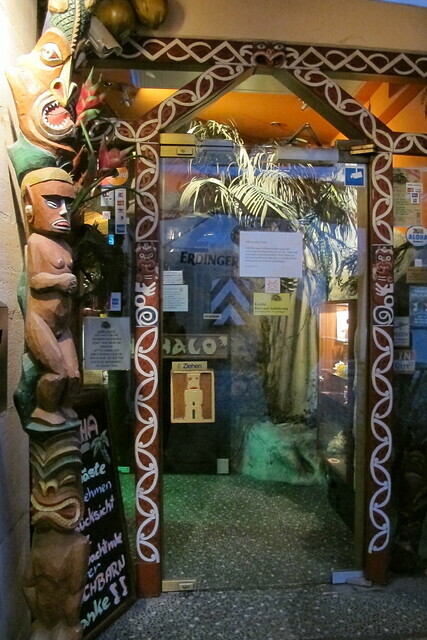 After entering through the glass door framed with Maori-esque designs, you’ll find the Sea Bar on the left. Fish netting and a fake shark and marlin emphasize this section’s theme, while the ceiling is laden with Orchids of Hawaii lamps, mini disco balls and a large outrigger. To the right is the reception stand and a tall Ku tiki, then there’s the Shabu Shabu Bar with pufferfish lanterns and gourd drums turned into lights. I love the miniature model ships, coconuts, shells and starfish placed along the counter. Details like this really make this place special. 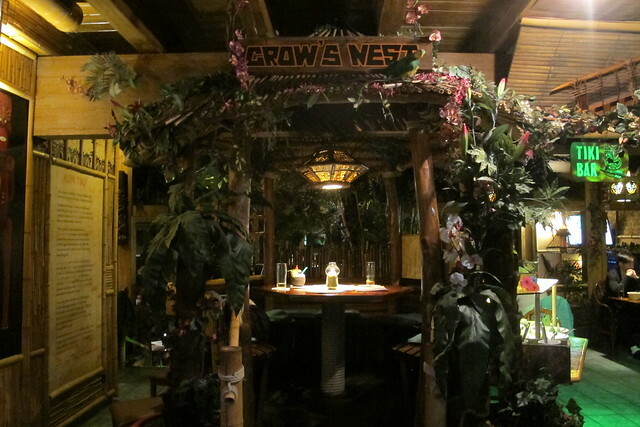 A few tables are ensconced in their own little nooks, like the Crow’s Nest, a bamboo hut festooned with faux orchids and foliage. When we first set eyes on it, my boyfriend said, “You should have reserved THAT!” (Next time, I suppose?) Making dinner reservations is indeed recommended, but we were there on a Tuesday and manager Harry Grötsch was kindly able to accommodate us without much trouble. 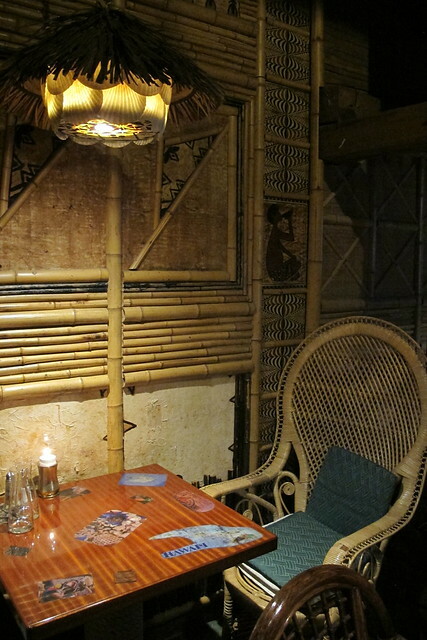 I was impressed by how much bamboo and handmade tapa cloth there is throughout. A sign relates (in English) that the original owners were inspired by a sailing trip to the South Seas and purchased much of the décor at antique shops in Honolulu. 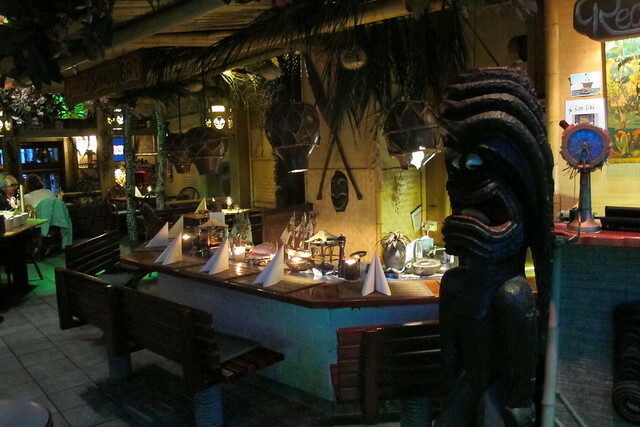 In 2002, a fire destroyed part of the restaurant and a lot of things had to be replaced. As you make your way among the other tables in the dining area, you start to see the unusual multi-level layout unfold. 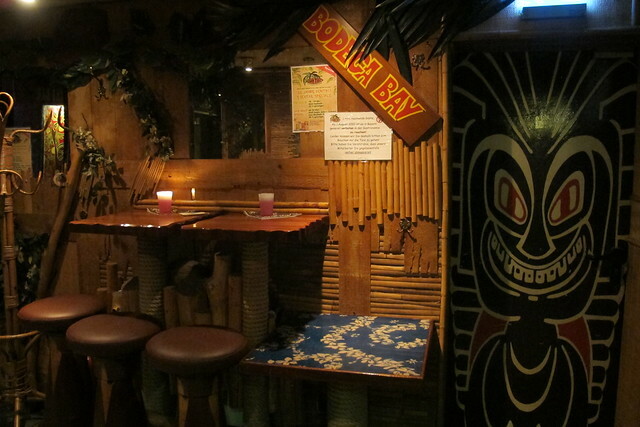 A plank leads out to another enclave with a single booth — Paradise Island — and below it on both sides are secluded dining areas separated by a glassed-in tropical tableau and accessed via different stairways. Deciding on a drink took some time as the menu lists more than 75 options, ranging from tiki staples (Mai Tai, Zombie) mostly priced around 9€ to classic cocktails (Manhattan, Negroni) to frozen margaritas and daiquiris. Browsing the appetizers, I was intrigued by the strange-sounding Pearl Harbour Toast (toast with turkey, banana, pineapple and kiwi, topped with cheese), but we played it safe with the popular Teriyaki Sticks. The thin slices of roast beef cooked quickly and were delicious dipped in the two sauces — teriyaki and spicy sweet and sour. 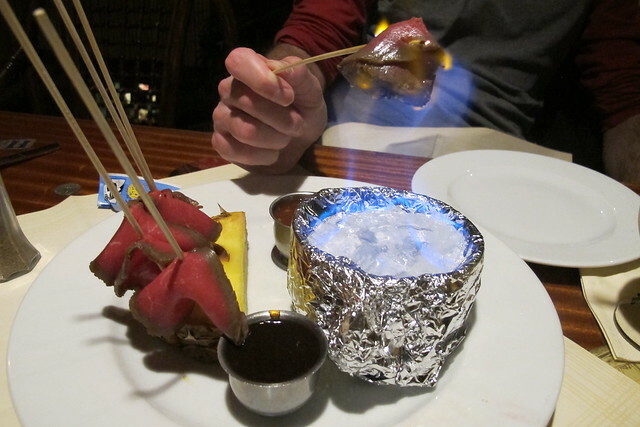 At Trader Vic’s, we often get the Beef Cho Cho skewers served in a similar fashion, but I thought this dish had the slight advantage. 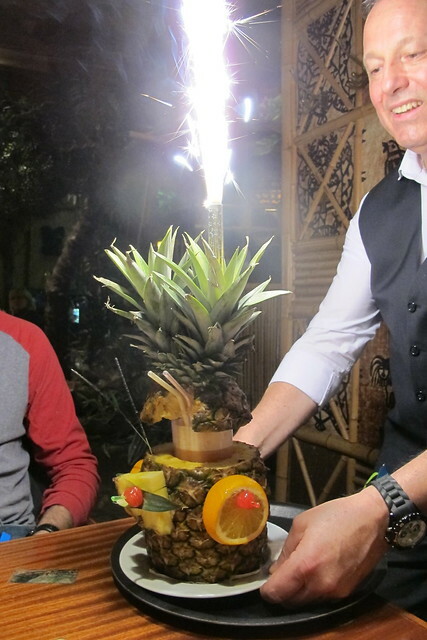 The Shrimp Boat (fried shrimp, more dipping sauces and sliced pineapple) was a nice change of pace from all the pork and potatoes we’d been eating in Germany. 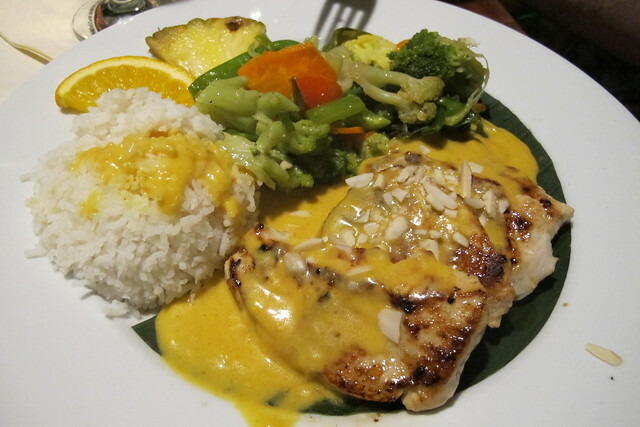 Other selections from the extensive menu include Asian stir-fry, Indian curry, steaks, ostrich, kangaroo and more seafood (mahi mahi, salmon, etc.). 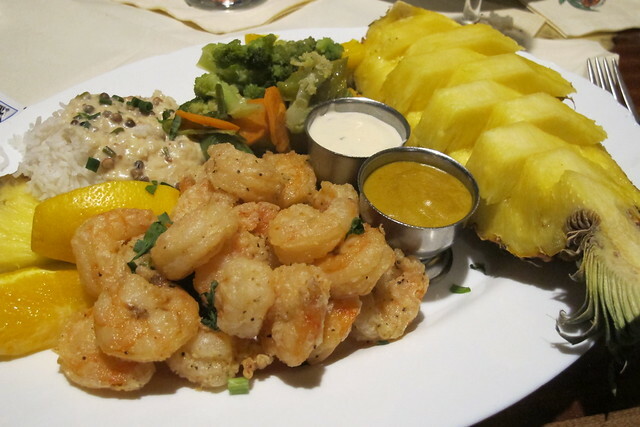 Most of the entrées come with white rice and vegetables, plus a salad bar buffet. A couple three- and four-course set menus are also available. Then there were two more sets of stairs. 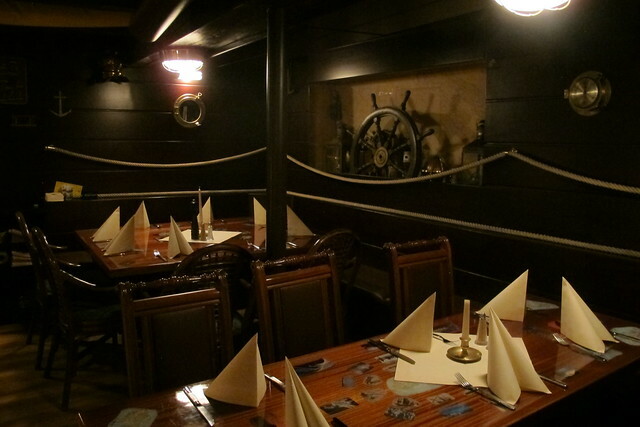 One descends into a room completely decked out with nautical paraphernalia. Portholes punctuate the dark wood paneling and there is a ship’s wheel and all kinds of other maritime instruments. 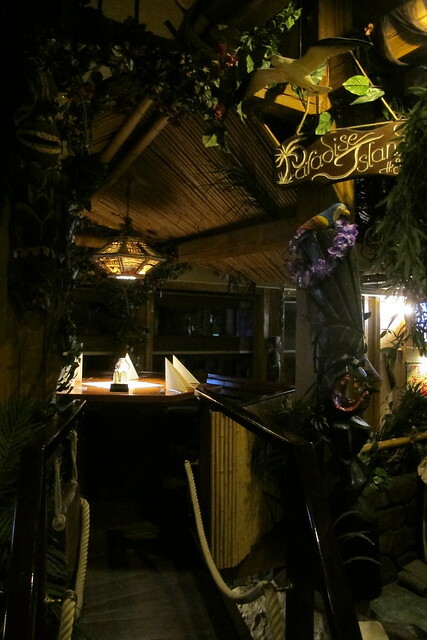 If you take the stairs going up from the landing, you’ll encounter the second bar, the Kon Tiki Bar, also outfitted with an outrigger canoe. 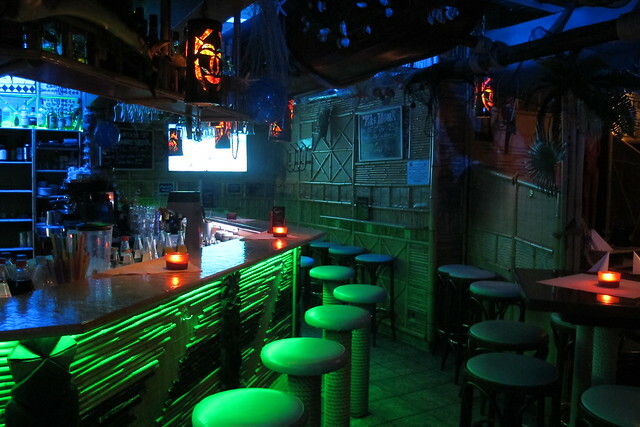 (There’s also a doorway out to a patio — this place just keeps going and going!) 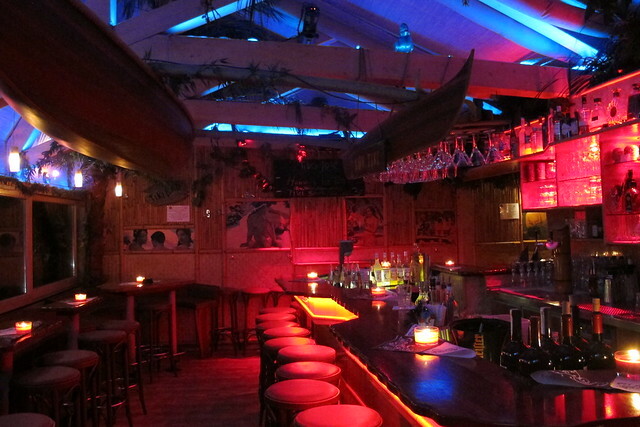 Kon Tiki opens every day at 6 p.m. and closes at 1 a.m. Sunday-Wednesday and 2 a.m. Thursday-Saturday. Happy hour is from 6 p.m.-7 p.m. with 25% off all cocktails, and from 11 p.m. all caipirinhas, juleps, coladas and low-alcoholic drinks are 30% off. Wow! I want to get on a plane and go, NOW. You must have been in heaven!